RCB vs GL 44th match IPL 9 Royal Challengers Bangalore vs Gujarat Lions 14th April 2016 AB De Villiers 129 run and Kohli 109 Highlights. First Time in history when two player scored century in IPl. Yes it is done by Virat Kohli and Ab De Villiers where De villiers scored 129 runs in 52 balls with 10 fours and 12 sixes while Virat Kohli scored 109 runs in 55 balls wit 5 fours and 8 sixes which make RCB total 248 with 3 wicket loss and RCB won the match by 144 runs. Royal Challengers Bangalore's star batsman de Villiers and skipper Virat Kohli combined to make mincemeat of the Gujarat Lions attack, scoring a century each in the process. 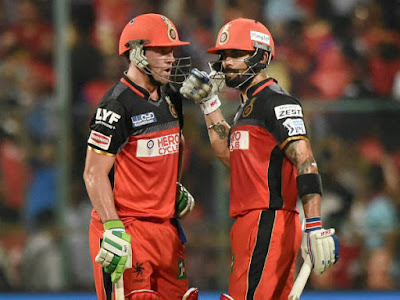 De Villiers' unbeaten 52-ball 129 and Kohli's 55-ball 109 decimated an increasingly feckless and indisciplined bowling attack; they required just 96 balls to put on a T20 record stand of 229.Batting first, RCB plundered a massive 248 for three courtesy de Villiers's 129 not out and an equally attractive 108 by Kohli with records falling like ninepins at the Chinnaswamy Stadium during the afternoon session. The duo’s twin hundreds and their mammoth 229-run second wicket partnership.Biggest Victory record in IPL. 14.5.2016 AB de Villiers and Virat Kohli on Saturday orchestrated a mayhem by scoring magnificent centuries as Royal Challengers Bangalore inflicted a crushing 144-run defeat on league leaders Gujarat Lions.